Do you know the history of this Armour Boulevard block? Drugstore at the southeast corner of Troost and Armour. The businesses that once lined the southeast corner of Armour and Troost are mostly gone now, with the remaining ones boarded up. 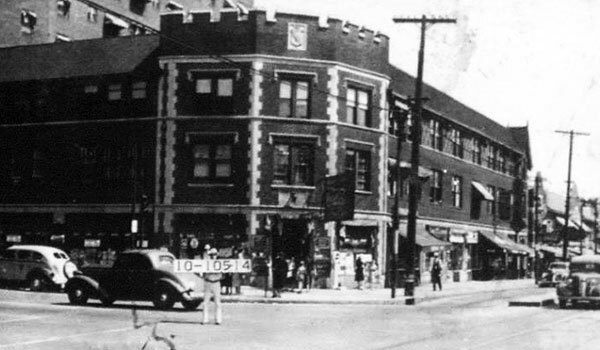 But in earlier days, the block from Armour south to 36th Street, from Troost to Forest, was a lively part of Armour Boulevard’s apartment hotel district. And the corner of Armour and Forest was the scene of a 1933 shootout. As part of our Uncovering History Project, the Midtown KC Post is taking a look at the 1940 tax assessment photos of each block in Midtown. (Many people seem confused by the tax assessment photos, which all include a man holding a sign. Here’s the story behind them). 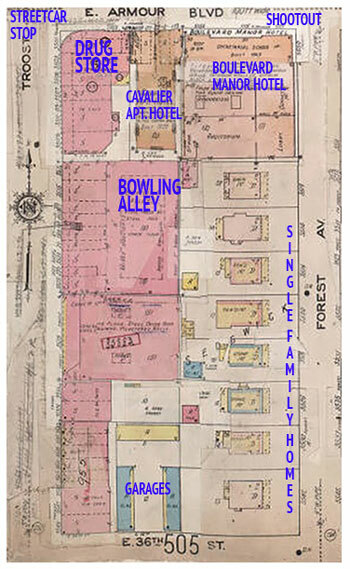 As seen in this 1909-1950 map (below), Troost Avenue from Armour to 36th Street was lined with businesses including a drug store and a bowling alley. The corner offered local entertainment and convenient shopping for folks traveling along the city’s most well-used streetcar route, the Troost line. 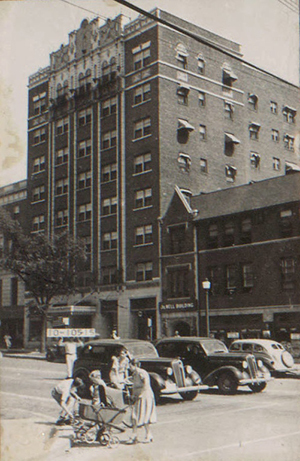 The Cavalier Apartment Hotel in 1940. Around the corner on Armour Bouelvard between Troost and Forest, the Cavalier Hotel (now gone) offered “bachelor apartments” in the 1950s and 60s. Just to the east, the Boulevard Manor Hotel (still standing but boarded up) was known for its dance club and pool where local kids took swimming lessons. On Forest Avenue, the block between Troost at 36th Street was lined with single-family homes, many still intact today. The corner of Forest and Troost was the scene of a famous shootout in 1933, when Kansas City Sheriff Thomas J. Bash accidently came upon a gangster-related execution involving an associate of gang boss Johnny Lazia. An assassin had already shot and killed several people when the sheriff’s car reached the scene. ” A sheriff who carries his riot gun to lawn parties chanced upon a gang murder today in time to visit swift death on two of the executioners and capture a third member of their group. The victim of the underworld death sentence, slain as the sharpshooting sheriff Thomas B. Bash went into action with his slug-laden weapon, was Ferris J. Anthon, a fugitive from a Chicago indictment naming him as a member of a liquor syndicate. The men who died in the assassins’ automobile, from which the burst of bullets that killed Anthon, were Sam Socia and Gus Pasone. They had been identified as operators of night clubs here, and as henchmen of John Lazia, northside political leader under indictment for income tax evasion. A ballistics expert who examined the bullet that killed Anthon said it was fired from a .45 caliber automatic pistol. That was also the description of a gun dropped by Charles Gargotta, captured by Bosch when the gunman pleaded for his life after emptying his weapon at the battling sheriff. A companion of Gargotta escaped. 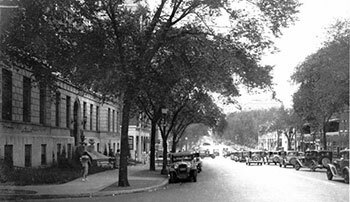 …”The staccato bark of firearms along Armour Boulevard, in the midtown apartment hotel district, and the screams of a terror stricken women arrested the attention of Sheriff Bash as he was returning with Mrs. Bash, 14-yer-old Melva Taylor, and a deputy, Lawrence Hodgez, from a lawn party. Stopping the automobile not far from that of the assassins, Bash seized his riot gun and dismounted to investigate. He was immediately forced into the fight by an attack upon him from the killers’ car. To keep the killers from escaping the deputy swung the automobile containing Mrs. Bash and the 14-year-old child into the path of their departing car. Meanwhile the sheriff blazed away with his riot gun The gunman’s car, its driver dying, crashed into the sheriff’s blocking automobile. “Don’t shoot me, don’t shoot me,” he sobbed, dropping a revolver at his feet. As Gargotta was taken to jail another fully loaded revolver was found in his pocket. Armour Boulevard at Forest in 1933, the scene of a triple shooting. One explanation of the fatal attack on Anthon offered by police was that a northside gang feared he might be the means through his Chicago connections, of importing gunmen to resist large vice payments which have been extracted from rival racketeers in other sections of the city. Anthon was arrested dozens of times in Kansas City, Kansas for liquor activities and once turned state evidence which led to the resignation of several city officials. His 24-year-old blond widow, who witnessed his death at the conclusion of an automobile ride about the city, was taken to the prosecutor’s office for questioning. The slideshow below shows the block from Armour to 36th, from Troost to Forest, from the 1940 tax photos. There’s still a lot more to learn. Do you remember this block? What special memories do you have of this section of Midtown? What questions do you have about it? Let us know and we’ll share your history and help to preserve it on our website as part of our Uncovering History project. Would you like us to focus on your block next week? Send us an email. Photos courtesy Kansas City Public Library, Missouri Valley Special Collections. I lived near Armour and Troost in the early sixties. I rented a dinky apartment in one of those many two and a half story area houses in the 3600 block of Harrison. I went to a local night club known as Oscar’s Lounge often on the south east corner, as well as King Arthur’s Lounge in the basement of the Boulevard Manor Hotel just east on Armour,.I even had a part time job working there. I visited many other night spots nearby, namely the San Souci Lounge and the Home Plate restaurant in a hotel just west of the Katz drug store at Linwood and Troost. I eventually got married and moved to Independence. IN 1990 I moved to California. I went back to my 50th high school class reunion in 2006 and revisited the area. Sadly almost all of the buildings had beEn torn down. SAD! © 2019 Midtown KC Post. All rights reserved.